Nearly a year ago I was quoted in New Scientist, commenting on some Microsoft research which auto-creates average-sounding backing music to somebody singing. At the time I said "I suspect musicians will argue that this is another step towards homogenised elevator music for all... But I see a big market for this, whether it's liked by musicians or not." Click here to read that original article. Frankly I was being polite, although my prediction seems to have come true for reasons I didn't guess. You can watch that awful video here. And some people have been ruining existing songs to hilarious effect using the software. Dear Peter Bentley, Unfortunately I missed your letter to Charles Darwin last week on Radio 4 and it's not available on iPlayer! I would love to listen to it, but in the meantime thought you may be interested to know about the 'ceramics' that I'm currently designing. 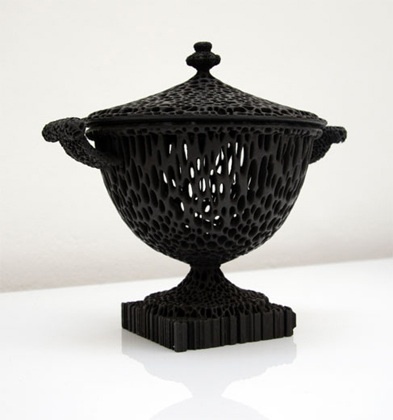 As part of my recent MPhil at the Royal College of Art I worked with a French company who have developed some very interesting processes and materials for use with ZCorp Rapid prototyping. I designed and made a piece called the Wedgwoodn't Tureen (see http://wedgwoodnt.blogspot.com for info) and am now working on a group of pieces with Charles Darwin as the theme. They will be Rapid Manufactured once I've completed adding the texture to the pieces. I intend to pierce them with a section of AGTC genetic code. An alternative construction method will be to use an algorithm that will build within the constraints of the 'envelope' of the piece. I am working on this project with Established and Sons and will be showing the completed work at their gallery in Duke Street St. James. 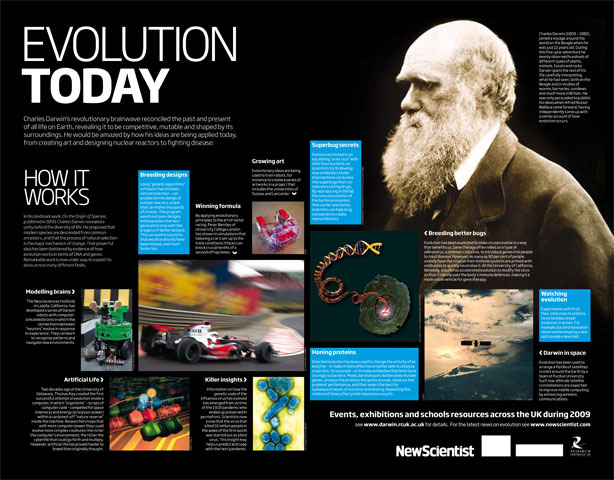 I am about to place an order on Amazon for Evolutionary Design by Computers and look forward to further engaging with the subject. Nice to hear from you. Go to my book blog and you'll be able to listen to the radio programme (they sent me a copy). Your work looks great - there's certainly potential for evolving forms such as this by computer. Good luck with it! Many thanks for the swift response Peter. I'll go straight to your book blog instead of my usual bedtime reading! Looking forward to receiving your book & CD. I'll let you know of how it affects my work. 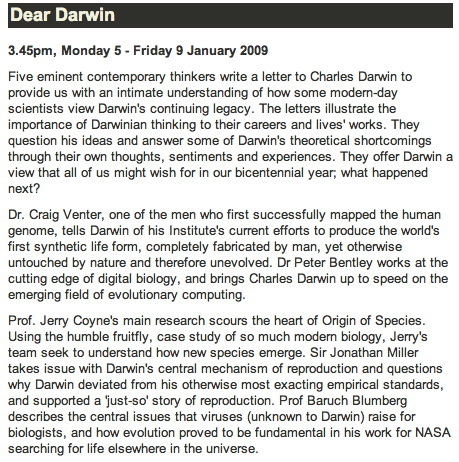 As mentioned in a previous entry, BBC Radio 4 commissioned me to write and record a fictional "letter to Darwin." It was broadcast on 8 Jan, 3:45pm. They also used a fragment of my recording as a trail for the whole series. So far the feedback seems to be positive from listeners. It's only available on the BBC website for a limited time, so I've put the final version on my website. You may need broadband for the file is around 7Mb. You can listen to the mp3 version by clicking here. You can also download a pdf of the letter itself by clicking here. A new UK version of the American science and tech magazine WIRED is being launched this year. Perhaps brave in the current financial climate, but they have good publishers and their older brother in USA has a long and excellent reputation. There'll also be a UK version of the WIRED website. One of the new editors got in touch recently and today I met him for lunch. Apparently he found one of my books recently and liked what he saw. So he invited me to be a contributing editor for the magazine. Not a full time position, but it means that I may well be writing a few articles for WIRED now and again. My other duty is to keep an eye out for interesting stories suitable for features relating to science and technology... which I tend to do anyway.